I've always liked cross stitch, it was one of the first grown up crafts that I tried. One of my very early pieces was this Cats Sampler from a book of cat themed cross stitch designs. Being a newbie, the mistake that I made was to start the work right at the edges of the Aida fabric so I didn't leave enough for framing - I've not made that mistake again! I also didn't use the colours suggested in the pattern as I was using up odd bits and ends of thread. I've still kept it though as I really like the design! 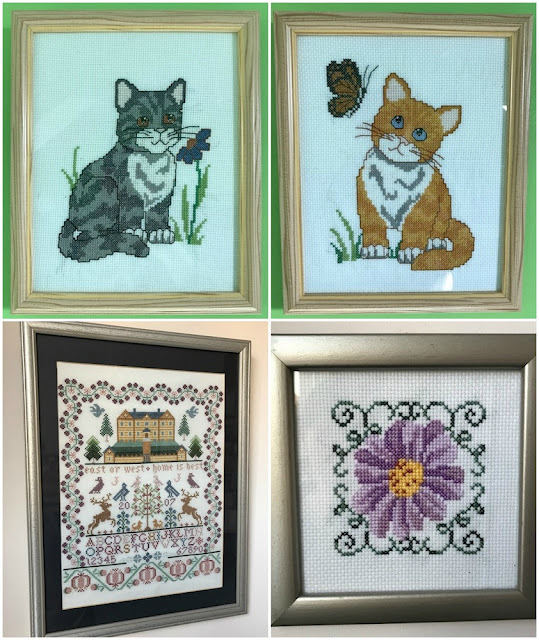 From there I moved on to two other cat patterns from the same book and I was much more pleased with them, they are currently hanging in our guest bedroom. I think they are very sweet! I recently pulled out the cat pattern book and saw another one that I quite fancy having a go at, maybe when I get to the end of my current project! 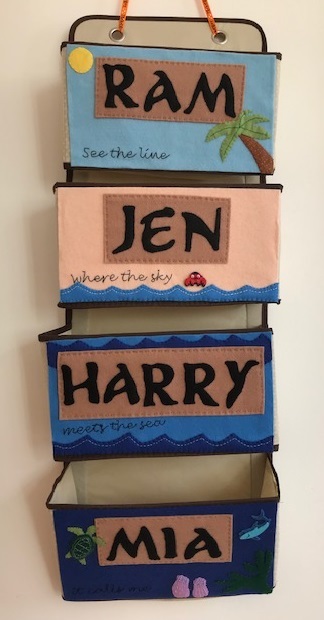 Buoyed by my success I decided to attempt a much larger project, and having always liked a nice sampler I chose the Moira Blackburn Three Things sampler (affiliate link) . I made a good start on it, then I started having babies, and although I do remember taking it on holiday with us when Harry was tiny I never had the time to do much work on it. After putting it aside for quite a time I eventually finished it in 2014, about seven years after I started it. I really love it and enjoy having it on display. I decided that was enough cross stitch for the time being, although I did do a few tiny pieces (those baskets by the till in Hobbycraft always have little kits in, far too tempting!) Then for my birthday last year I asked for and received a Cross Stitch Map (affiliate link) which I really love and I had lots of enjoyment stitching in the places that we've visited. This made me think that I'd quite like to start another long term cross stitch project, so before Christmas I had a good browse and settled on the ABC Christmas sampler (affiliate link). I'm not expecting to finish it by Christmas this year, as once the stitching itself is done there are lots of little beads to add, but perhaps I'll have it finished and on display by Christmas 2019! It's quite tricky in places, in some areas there are several different shades so you really need to concentrate on it. I've also joined a cross stitch group on Facebook and I love browsing through and seeing what other people are working on. The trouble is that it has introduced me to lots of other designs, and while many aren't to my taste, occasionally I spot something that I rather fancy having a go at. I can see how easy it is to build up a huge stash of kits and patterns! I've seen some amazing designs that are enormous and use hundreds of different colours and make my projects look rather tame, I'm wondering whether to really challenge myself next time!